Easy Cash Club review - Scam or legit? NO ONE TOLD YOU this! Home > Online opportunities > Easy Cash Club review – Scam or legit? NO ONE TOLD YOU this! 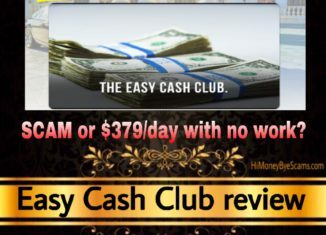 Easy Cash Club review – Scam or legit? NO ONE TOLD YOU this! Welcome to my Easy Cash Club review! Are you wondering if easycash.club is a scam or a legit system that can make you money with no work? If that’s what you are wondering, keep reading because you are in the right place! First of all, I must congratulate you for taking the time to do your own research before making another purchase. There are too many frauds on the Internet, so I’m glad that you are doing your due diligence because that’s the way to avoid scams and find the real way to generate passive income online! When it comes to Easy Cash Club, it’s not as awesome as they have told you and this honest review will prove it to you. 2 What is Easy Cash Club about? 3.2 Who is Steve Johnson? 4 Is Easy Cash Club a scam? The moment I heard “Easy Cash Club”, I thought it was another overhyped system or scam because the title makes it sound as a system that can make you easy or quick money, which is actually not possible. It actually reminds me of other programs I have exposed like Fast Cash App or Instant Cash Solution, since they also sound like programs that you can use to get money on demand. This kind of programs are the ones that give a bad reputation to the Internet marketing industry, since they are making “earning money online” look like something that’s easy or fast, when it really isn’t. But anyway, what is Easy Cash Club? According to the spokesman, it’s a software that makes it easy to create YouTube videos, upload them and make you money. He says that this is newbie-friendly, which means that you don’t need any prior experience or special skills to make it work. Sounds cool, right? It’s so easy to get excited when you hear that you only need to work 30 minutes every day to make $379 with this software, and that it runs on complete autopilot. 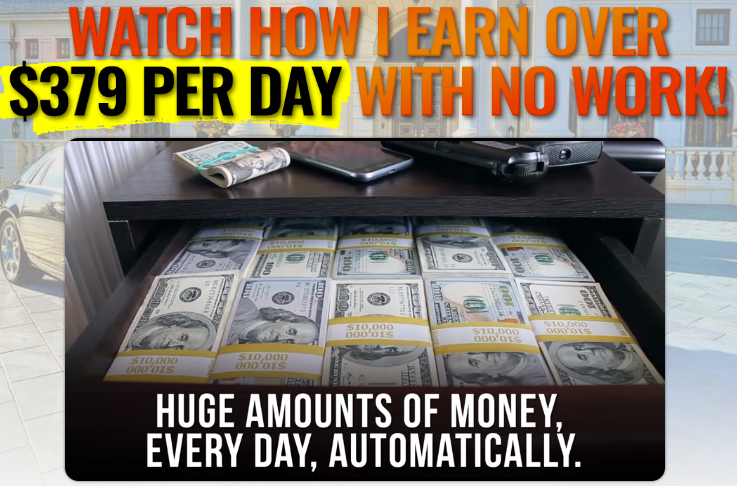 However, he makes those kind of claims to make you believe that this software is the solution to making money overnight, when the truth is that it’s not that good. It’s completely possible to earn money from YouTube, and you may already know that there are people who earn millions. But it takes time and effort, and there are sooo many factors to take into consideration when it comes to making money. YouTube definitely doesn’t allow everyone to monetize their videos, there are some requirements that you must meet before they enable you to earn money. For example, you need a minimum of 1,000 subscribers and a minimum of 4,000 hours of annual viewing time. You see, if it was as easy as “Steve” claims, don’t you think everyone would be a Youtuber already? Yes, you can also monetize your videos through affiliate marketing, but it’s not an easy or fast way to make money. No matter the method you use to make money, there’s no way to make it overnight if you are just getting started. So, let’s see how Easy Cash Club really works and what they are hiding from you. Easy Cash Club does not work to make you money easily or quickly, that’s for sure. Like I said, there are no systems or websites that you can use to get instant cash, so this is not for you if you need money today. If you decide to buy this product, you will get access to step-by-step video training about using this software to create videos and upload them to YouTube. First of all, you will need to open a YouTube account if you still don’t have one. Without a YouTube account, you cannot upload videos. In order for the software to create videos, you need a written text or audio file. Then you will have to select the text you want to use and add some pictures. This software uses artificial intelligence, which makes the voice in the video sound like a human voice instead of a robot. I think this is great for people who don’t like to talk, but it can also look a little bit artificial to your viewers. For example, when you watch a video, wouldn’t you trust more someone who shows up than someone who hides their face? Anyway, once the software has created the video, you will have yo download it and upload it to YouTube. Before publishing your video, you will be able to add a description to the video, which is where you can add links. For example, if you want to earn money from someone else’s product/service, you can add your affiliate link to the description of the video and if someone buys something through that link, you will earn a commission. The next step is to sign up to Google AdSense, which is an ad network that you can use to make money with a website/blog or YouTube videos. If you get approved, you will earn some money when people click or watches your ads. When it comes to YouTube videos, you only get to make money if people watch your ads for 30 seconds or more. So you can only expect to make money through ads when a lot of people watch your videos, and this is something that takes a lot of time and effort. Before earning money from ads, you first need to create original & relevant videos, get lots of subscribers and video views. That’s the way YouTube will allow you to monetize your videos. The more videos you create and the more views your videos get, the more revenue you can generate. You will first have to put into a lot of effort, but if you are persistent and don’t give up, you can earn a full-time income for the long-term. There are two sales pages for Easy Cash Club: a written sales page and the sales page with the video. 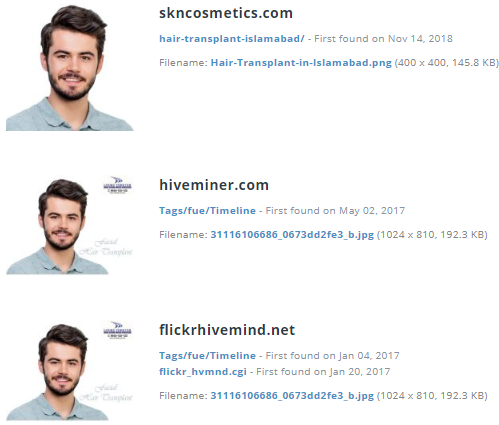 I took a look at both of them and I noticed that the written page comes with some testimonials, so I decided to do some image searches to see if these testimonials were genuine or not. For example, this man from the picture below is not a real member and hasn’t earned $3100 in 4 weeks. He has nothing to do with Easy Cash Club. As you can see, the picture of that man appears in different websites, which means that the owners of Easy Cash Club has downloaded it and used it to create a fake testimonial. Also, they are marketing Easy Cash Club as a get-rich-quick scheme because they say that making $35,000 a week only takes a few clicks, which is a total lie. Like I said, building an online business and making money online takes time and effort, so don’t let these unethical marketers fool you! Anyone who claims you can make a lot of money within a short period of time is trying to take your hard-earned money. If I asked you who is Steve Johnson, you would say that he’s the owner of Easy Cash Club, am I right? However, would you be able to prove it? I personally cannot prove that he’s the real creator of Easy Cash Club because he doesn’t show any picture of himself and he doesn’t even tell us how to get in touch with him. If he’s making money with a YouTube channel or if he has a website, why doesn’t he mention it? Why doesn’t even say if he’s on social media? You see, most people (not to say all) who are making money online usually have a social media presence. The fact that this man doesn’t reveal his real identity is a red flag to me, since it indicates a lack of transparence. After having reviewed hundreds of websites & products, I have to say that I believe Steve Johnson is a fake name that con artists are using to market Easy Cash Club. Scammers usually avoid saying their real names because they don’t want to face the consequences of scamming. If you purchase Easy Cash Club, you can expect to get bombarded with some upsells right after making the payment. As you can see, it costs over $200 + a monthly fee of $17. That’s how the owners of this product get to make the big bucks! Don’t you think it wouldn’t make sense that they only wanted $37 per customer? They will try to profit as much as possible. Not only that, if you give them your personal information like your email address and your phone number, you can expect to receive some emails concerning other scams or money-making systems & some sales calls. Something that no one has told you about Easy Cash Club is that it has been created by the same people who created Take Surveys For Cash and Writing To Wealth, which some people called scams. How do I know this? The sales funnel for these products are very similar to the Easy Cash Club sales funnel! As you can observe, they use the same design for both products and all their upsells are 1 click upsells, which means that you only need to click once to buy them. Whether Easy Cash Club is a scam or not depends on your point of view. If you purchase this product expecting that you will make money overnight, then you will call it a scam. But if you buy Easy Cash Club because you want to start a YouTube channel, you will not consider it a scam. In my opinion, Easy Cash Club is not a scam because you get something for your money and you can also get a refund if you buy it and end up not liking it. I also want to add that I don’t consider Easy Cash Club a complete program because it’s basically focused on how to make money from YouTube. When it comes to building an online business, it’s important that you don’t put all your eggs in the same basket. In other terms, you cannot only rely solely on YouTube if your goal is to build a long-term business because you don’t really own your YouTube channel. That’s why I believe it’s essential that you first create your own platform a.k.a. your own website. Therefore, in my opinion Easy Cash Club is mainly for people who are looking to expand their business with YouTube. I don’t believe it’s for beginners. That’s why, if you are just starting out, I don’t recommend Easy Cash Club. Some years ago, when I was getting started, I thought there was some kind of trick or magical system that made it possible to get money on demand. But soon I realized that they all were scams or low-quality products that did not work. Most products that promise easy riches have been created for product owners to get richer. This is the hard truth. I’m glad that I found the affiliate marketing business model and stopped wasting my time on products that didn’t work. It wasn’t until I got focused that I started making real profits. You see, affiliate marketing is a legit business model that has been working for decades and it doesn’t require you to recruit or promote the same as everyone else. You will be able to choose a topic you are passionate about to build this business, which will make you enjoy the process because you will be talking & writing about something you love! Additionally, you don’t need to worry about doing this alone because you will be able to get my personal guidance and support! What’s more, you will be able to ask all the questions you want because the place I show you has a community full of affiliate marketers willing to help you out. Oh, and did I mention that you can also start today for free? If you read my guide until the end, you will see how you can start immediately without spending a dime! So what about you? Are you ready to stop wasting your time on incomplete programs and start building your affiliate marketing business today? I hope this Easy Cash Club review has been helpful to you and you will make the best possible decision. 22 Minutes To Profits SCAM – Review exposes this FAKE PROGRAM! Cash Formula review – Is cashformula.co a scam system? UGLY TRUTH exposed! Hi Miren! Thanks for your wonderful review. This will save some folks from being scammed especially the newbies. The sad thing is that this get rich fast programs always target newbies, of course a pro in the internet marketing cannot fall for such programs without making intense research. So my advice to people starting out in online marketing, always do your research well before parting with your hard earned bucks. They often make the whole thing look and sound so magical that you might be hooked. There is no free money, to succeed online one needs to work hard. You can imagine, giving fake testimony to gullible folks just to swindle one of his money. Sadly, the owner of that pix might not be aware that his picture is being abused. I really appreciate any moment I come through a review on scam or legit, this is because I have gone through many not really scams but unworthy online money making platforms, and as I results I always like going through some reviews before making a decision on whether to join it on not. I am lucky today to have come across this post as I was actually thinking to start on the Instant cash solutions, only to find out that it’s not worthy starting as I learnt that from this post, I really want to thank you for that. For the easy cash club it sounds so attractive but personally I have learnt it’s not worth to operate, as I followed your link to your preffered make money platform I must say I will have to make some step out of it, I am sure to follow your posts to learn more from them, thank you. NewsHot17.com review – Is News Hot 17 a scam? Profit Ball review – $1000 a day or BS? Secret Millionaires Club review – Scam exposed!